Famously known as one of the most powerful Mediterranean ports of its day and the birthplace of the navigator who changed the face of the globe, Genoa is a picture of gentle decay whose attractions are not scrubbed up to match the standards of Turin to the north or Florence to the southeast. But if you are willing to get lost in its ‘caruggi’ or back streets and alleyways – which incidentally makes driving a Genoa motorhome rental or campervan hire in Italy highly improbable – or have the energy to pull yourself up the hills, you will get to experience Genoa’s ‘vicoli’ or historical center that saw Christopher Colombo set sail for the New World. Genoa’s tiny streets or lanes, which make it ideally walkable, are not well-suited for travel by Genoa motorhome rental. Fortunately, there are plenty of campgrounds about 30 minutes from the city centre and right by the Ligurian coast where you can stash your campervan hire in Genoa as you explore ‘lodging palaces’ in the UNESCO-inscribed Palazzi dei Rolli and museum upon museum in Genoa’s vicoli. Some of the most popular attractions are by the sea, which is just fitting for a city that once held the Mediterranean at the palm of its hands. To get a feel of what it was like in its heyday, leave your RV rental in Genoa outside of its fortified walls and stroll back to time and enjoy cafe life at Porto Antico or the Old Harbour’s promenade. You would not want to miss the pile of carnation- and rust-coloured buildings of Boccadasse or the Fisherman’s quarter, nor the Spianata Castelletto where you can take in unimpeded views of the city and the coast. Baroque buildings sit along Via Garibaldi and offer a pleasant architectural diversion as you make your way to the birthplace of Columbus in Piazza Dante. What Genoa lacks in splendour these days, it more than makes up for what it has to offer outside of its fortified walls. Genoa is the capital of Liguria, which people in the know consider as the original Riviera. Even with Genoa motorhome hire campgrounds right by the sea, you would not want to miss the sparkling blue waters, wide beaches and spectacular sunsets of Riviera di Ponente, nor the weathered and craggy shores of Riviera di Levante. Liguria is strewn with campgrounds, so exploring the region by campervan rental is one of the best ways to enjoy its offerings. On the western arc of the Ligurian coast about two hours out of Genoa is the classic good looks and old-world resort feel of San Remo whose 19th century villas and medieval old town are all worth a visit. 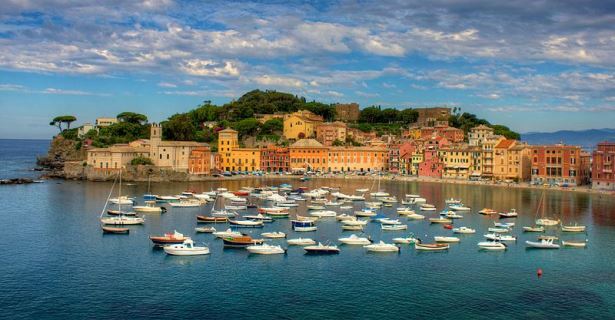 If you want a taste of the yachting life in a picturesque fishing village setting, drive your motorhome hire in Genoa, Italy east to Portofino, less than an hour out. Farther afield is La Spezia, an hour east of Portofino, where Italy’s first national park is located. Venture out to the UNESCO-protected Cinque Terre National Park by Genoa campervan hire for a breathtaking picture of earth, sky and water and nostalgic cliffside villages. The Pelagos Sanctuary (originally, the Ligurian Sea Cetacean Sanctuary) is a great place to scope out dolphins and fin whales in the summer and provides a stunning backdrop for photo opportunity whatever the time of the year.